I was having trouble getting the flavors just right for Lipton's bottled diet green tea, which has become such a big seller. Real lime juice wasn't cutting it, nor were any of the extracts or oils I tried. 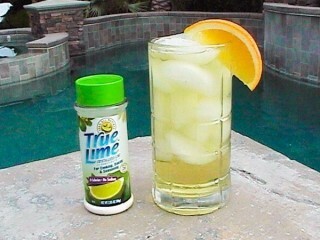 Then, one day, I stumbled onto a new product called True Lime. It's a crystallized lime substitute that's made with lime juice and lime oil, and it comes in 2.85-ounce bottles or in boxes of 40 packets. It can be found in the baking aisle of your local supermarket, and it can be used for cooking wherever lime juice is required, or you can dissolve it in beverages. Had I found my secret ingredient? After some experimenting, I discovered that the citric acid in True Lime adds just the right amount of acidic tang that we need for a clone that tastes like the original product (which also contains citric acid). Success! To make your own version of this popular bottled green tea, simply pour some boiling water over a couple green tea bags, add the other ingredients listed below, and you'll soon have a home-brewed clone of Lipton's hit drink. Calories not included. 1. Pour the boiling water over the tea bags and steep for 1 hour. 2. Combine the tea and remaining ingredients in a pitcher, whisk to dissolve the Equal, and chill well before serving. So I made the tea the first time exactly how it says, and it was good but just too orangey. It overpowered all the other flavor. So the next time I put half the amount of the orange extract and it was AMAZING!